What is the District Plan Review? The District Plan Review is an opportunity to reconsider everything in the Timaru District Plan 2005. It's not exactly starting from fresh, but uses the current District Plan's provisions as a starting point. There are also various matters the new District Plan must comply with. If the review finds we need to completely reconsider our approach to a particular issue, then there is scope to do that. The process for a District Plan Review is set out in the Resource Management Act 1991. Simply put, we have to do it. The Resource Management Act requires Council to review each provision of a District Plan every ten years if it has not been reviewed or changed in the meantime. How does the District Plan affect me? There are a variety of ways the District Plan can affect you. If you own land, the District Plan controls what type of activities you can do on that land, what you can build, how high and certain aspects of the design. Amongst other things, it also controls whether you can subdivide that land and how much noise you can make. District Plans also control what is happening next door and in your neighbourhood. The District Plan Review provides you an opportunity to have your say and potentially influence how the new District Plan addresses those matters in the future. 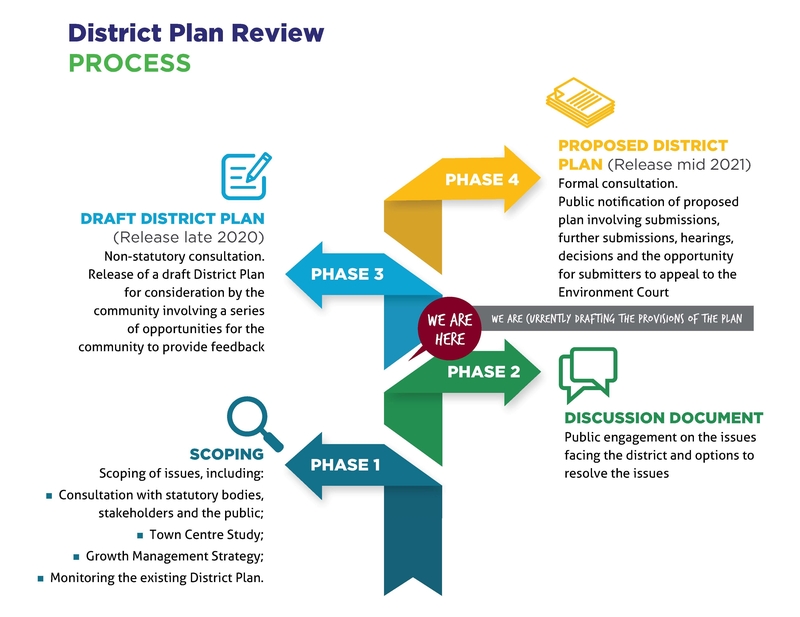 What phase is the District Plan Review in now? Discussion documents have been completed on the issues for each major topic. A booklet that summarises the community feedback on the discussion documents has been released. The booklet also includes the Environmental Services Committee's initial direction for the review. Staff are now drafting the new plan. 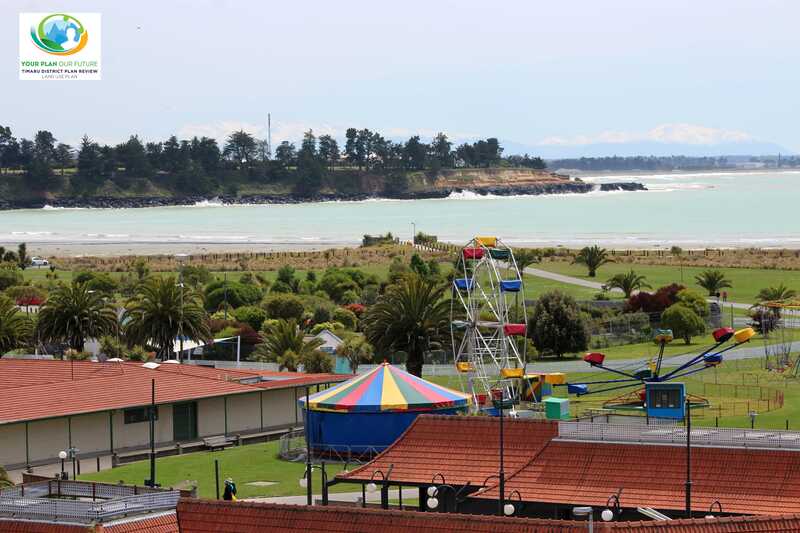 This will take into account the direction obtained to date from the discussion documents and Timaru District 2045 Draft Growth Management Strategy (GMS). The initial Committee direction and GMS was then used by Council staff and consultants to draft plan provisions. This is being considered to align with the direction provided by the government on the National Planning Standards in drafting. The diagram below illustrates the District Plan Review process and where we are in that process. Please note land use growth is being dealt with in the GMS. Any direction provided by the draft Strategy will inform the new District Plan. For a list of current and completed consultation topics, please visit the District Plan Review Consultation Page. How are the Draft Provisions Developed? Development of the draft provisions goes through a rigorous process. First, a report is prepared that documents the statutory context and issues associated with a plan topic or chapter. The report then assesses the effectiveness of the options and the costs and benefits of each option. Conceptual provisions are then brought to Council’s Technical Working Group. This group consists of key Council staff, consultants and representatives from Environment Canterbury and AECL (Te Runanga O Arowhenua’s environmental consultancy). Once the conceptual provisions are agreed, they are then workshopped with Council, after which detailed provisions are developed and then agreed by the Technical Working Group. The provisions are then externally peer reviewed, legally reviewed, before being presented to Council for final comment and adoption. This provisions at this stage are only being adopted for consultation as draft provisions. During the drafting of the District Plan Review, targeted consultation on some topics will also take place. Targeted consultation with landowners is planned to commence before June 2019 on the Ecosystem and Biodiversity Chapter and Heritage Chapter. This consultation is limited to affected landowners only in order to seek their views on matters that may affect them directly. 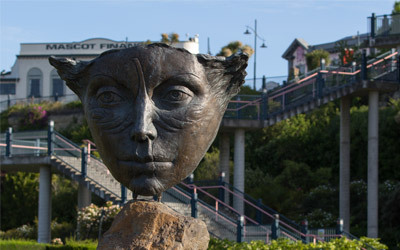 Public consultation on these chapters will occur with the release of the Draft Plan and subsequently the Proposed Plan. Relevant stakeholders have been involved (or will be involved) in the development of the draft provisions through the Ecosystems and Indigenous Biodiversity Steering Group and the Heritage Steering Group.